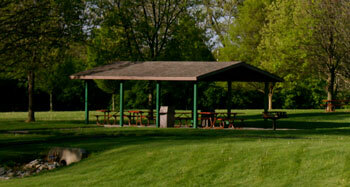 Park shelters are available for rental from April 15 to October 15 between the hours of 11:00 a.m. and closing. Resident and non-resident fees apply. To make a reservation, please call (513)683-6644. A deposit and Maintenance Impact Fee will be required within three working days after the reservation is made or the reservation will be canceled. Payment of the Maintenance Impact Fee may be by check or credit card. If you are using a credit card it must be processed at the Township office and a convenience fee will be added. Payment of the deposit must be made with a check. If you will be paying for both the Maintenance Impact Fee and the deposit by check, two separate checks are required. No cash will be accepted for either transaction.